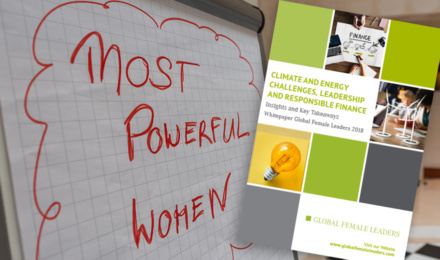 Renewable only countries, zero emission engines, mobility as a hot area of investment and examples of smart cities in China were highly discussed themes at the Global Female Leaders 2018. In the second part of this review, we focused on the keywords sustainability, mobility and leadership. Sustainability is part of brand building, especially in today’s world where more employees voice their preference for socially and environmentally responsible companies. The next two major pillars of the review will address environmental challenges and future of mobility, corporate leadership and responsible finance. Sustainability is an Opportunity – Not a Constraint! With our premium downloads we provide you with a complementary service to our events. You may read interviews, analyses, whitepapers and reviews of our summits and conferences, and get exclusive background information on their broad themes as well as their most important topics and debates. Please fill out the formular below to receive the download link. You can also request the download link without consent from our customer service by calling +49(0)6196 4722 800.